I read an old headline last week that on May 27th 1902, Vancouver’s baseball team defeated the University of California on the Powell Street Grounds (now, Oppenheimer Park). Seeing this tidbit on the Vancouver History website made me realize that I have never actually talked about Vancouver’s Japantown before and the significance of the Powell Street neighbourhood. 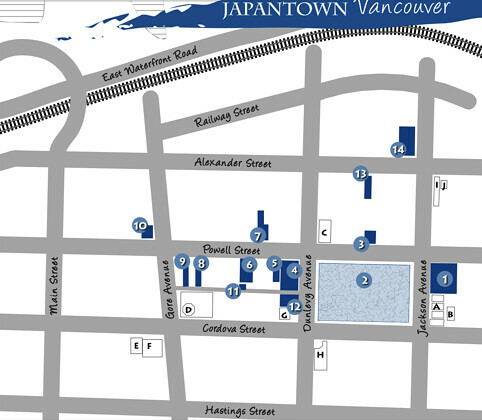 In the early 1900s Powell street (300-400 blocks) and parts of Alexander were Vancouver’s Japantown. Immigrants setup shops, markets, and their homes in this community that was a part of a very young Vancouver at the time. The Vancouver Japanese Language School, the Vancouver Buddhist Church, and Japanese Hall were established in the thriving neighbourhood. In 1907 the “Asiatic Exclusion League” marched on Chinatown, then Japantown, smashing windows and attacking residents – considerable damage was done to the community. In 2007 a “Riot Walk” through Chinatown and former Japantown was staged to remember this violent act of racism. “Despite this setback, the community had extended well beyond the original Powell Street corridor to encompass a much larger area, extending into Strathcona and — by the 1930s — beyond into many other neighbourhoods in the city. The community was forced to become more self-sufficient, and Powell Street became the economic, social and cultural focus of Japanese-Canadians, not only those in Vancouver, but for those across the province.” [source] The Powell Street community had expanded and began to prosper, with a strong commercial core including the Maikawa Department Store at 328 Powell. 1942. Japanese Canadian Relocation Notice. More injustices occurred during the second World War, when those of Japanese decent were shipped off to internment camps around BC. They lost their homes, their businesses, their possessions, cars, boats, and families were torn apart. Not many could return to Japantown as the government limited their post-war freedom. In 1945 they were told they could stay in Canada if they moved East of the Rockies, settled in Ontario, Quebec, or the Prairies. A few returned to the Powell Street community in 1949, when they were permitted to do so, however the neighbourhood was never the same, and it lost its distinction. 1942. Men’s Temporary Dormitory at the PNE Forum. VPL Accession Number: 14918. While Japantown no longer distinctly exists, as Chinatown does, Canadian Japanese heritage is strong, proud, and has pushed through to continue to be an integral part of our society and our city. The Powell Street Festival Society started up in 1977 to celebrate Japanese Canadian culture in the heart of where all began. This year’s Powell Street Festival will take place July 30th and 31st but the society presents performances and special events throughout the year. During the summer months you can go on a Japantown walking tour, departing from the Vancouver Buddhist Temple at 220 Jackson. My family came to Vancouver almost 100 years ago and settled in Kitsilano (where there were a lot of Japanese settlers, and South Asian as well). ‘More injustices occurred during the second World War, when those of Japanese decent were shipped off to interment camps around BC. Thank you for posting this. From what I’ve seen, most folks are completely unaware of Powell Street’s far more glamorous past…and of the dark history that saw it’s subsequent demise. Perhaps curriculum differs here than where I grew up in Ontario, but in my entire scholastic career, the internment of the Japanese Canadians was never mentioned. I only knew about it when my grandmother finally opened up and spoke of her experience as a Canadian-born “Japanese” woman. She was born in Vancouver, and grew up on Powell Street. She helped out at the family business – she was an instructor at the archery academy that was somewhere in the 300 block of Powell St. (if her failing memory is accurate). If you (or any of your readers) happen across a picture of it, please let me know. My grandmother is suffering from late stages of Alzheimer’s, and spends a great deal of time reliving her pre-war days. She often speaks of Powell Street, and of the community and the neighbourhood. Apparently, their archery academy was a favourite place for mill workers to practice and socialize. She relocated to Montreal after she was released from the New Denver internment camp, and has never returned to the province that imprisoned and banished her whole community. If anybody has a picture of their academy, I’m certain it would bring her some peace, and my immense gratitude.